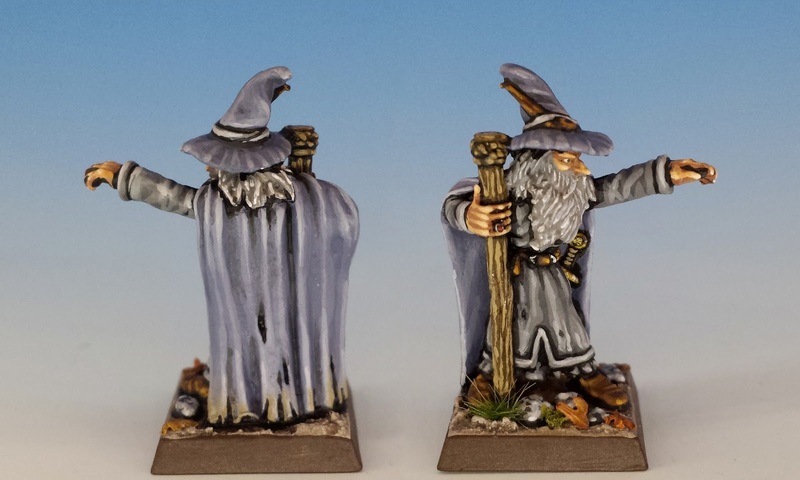 Here's a complete set of the Fellowship of the Ring, the Nine Walkers -- miniatures from Citadel's 1980's range of the Lord of the Rings. 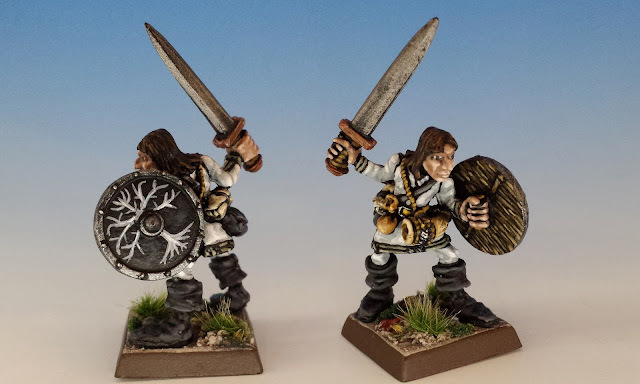 I painted them up a few weeks ago, for use in Ares Games' War of the Ring, which is one of the best board games I've ever played. 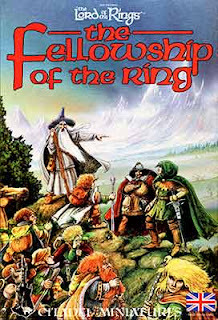 Citadel only had the license for The Lord of the Rings for a short time in the mid-1980's, before the torch passed on to Mithril Miniatures. The brevity of Citadel's stewardship gave rise to a patchy range of miniatures. By my count, there are 4 different figures of Gimli, 5 of Aragorn and 6 of Gandalf. Yet many major characters are absent: there's no Faramir, no Eowyn, no Eomer, no Galadriel and no Glorfindel. And there are other problems with these miniatures. First, a wide diversity of sculpting styles from the various Citadel sculptors deprived this small range of coherency (unlike, for example, the Talisman range, where Aly Morrison's re-interpretation of Gary Chalk's illustrations created a highly recognizable family of miniatures). Second, the Lord of the Rings range bled at the edges into Citadel's larger Warhammer Fantasy Battle range: Noldor elves became WFB High Elves, and the Orcs of Middle Earth were virtually indistinguishable from the Orcs of the Old World. 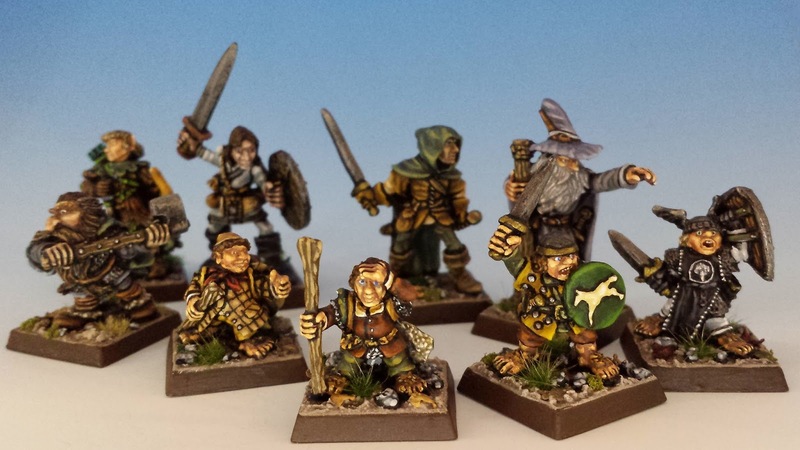 As a result, some of the miniatures don't stand out as uniquely Tolkien-esque. And yet I still love these models, especially the Nine Walkers. 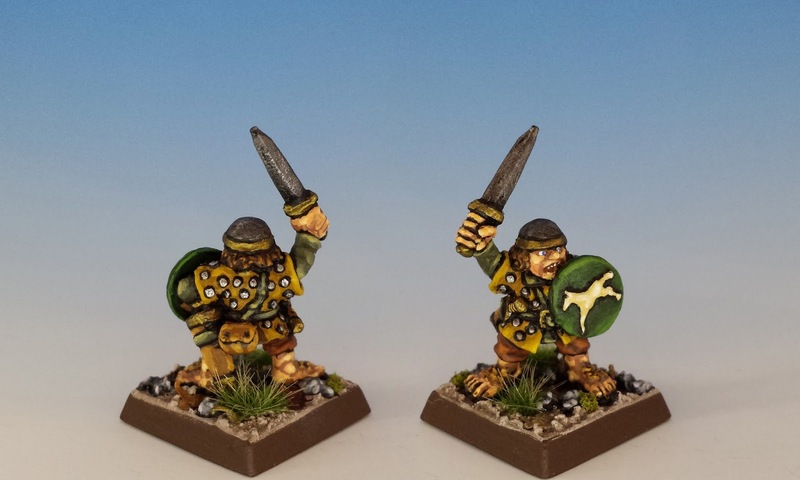 They boast the best of Citadel's golden age: character-driven miniatures full of gesture, personality and mischief. They are sculptures that artistically jettison photo-realism so that they rather appear to step out of illustrations by John Blanche, Tony Ackland or the Brothers Hildebrandt. Indeed, this freedom from realism is what separates Citadel's 1980's LOTR miniatures from the later miniatures sculpted by the Perry Twins from 2001 onward. The later miniatures are modeled after characters captured in film, whereas the 1980's range arise directly from a world of books. "A stout little fellow with red cheeks... But this one is taller than some [hobbits] and fairer than most, and he has a cleft in his chin: perky chap with a bright eye." (FotR, Book I, Chapter 10). I've tried to show Frodo midway through his quest. Although his eyes are still bright, the Ring is beginning to take its toll. Charming paintwork, nice write up. Excellent stuff. 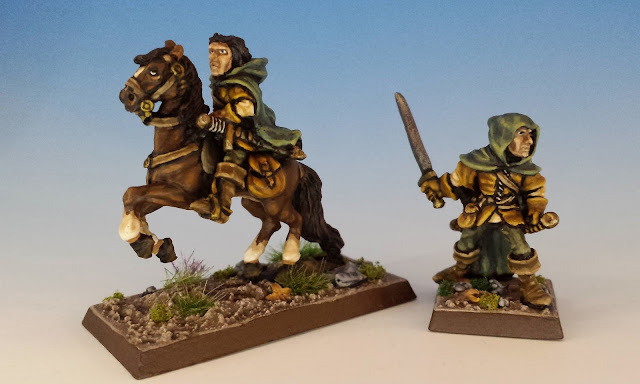 I had a Citadel 'Fellowship' set as a kid, complete with Black Riders and Bill The Pony. I keep hoping they will turn up with my MERP stuff in my Mum's loft space but as time goes on all hope fades! Oh man - I hope you find them! 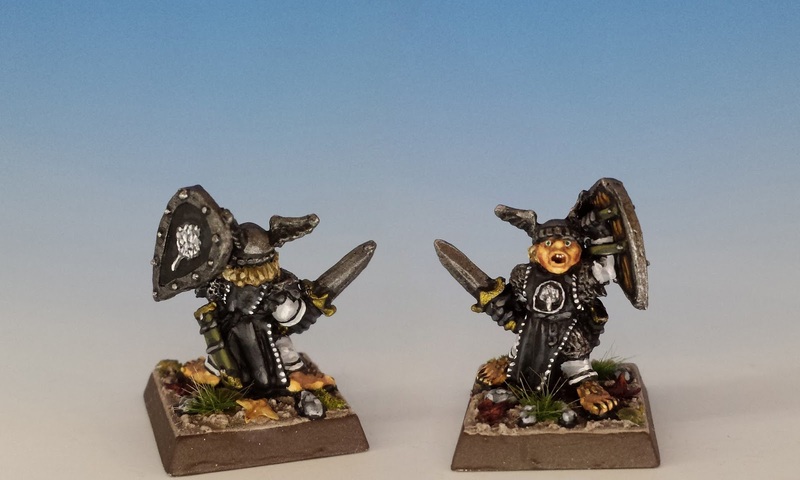 Lovely figures,well painted and a very interesting post. Really lovely work on these - Legolas especially so given the detail on that mini. I agree with your comment that the range is odd given the repeated focus on some minis yet other main characters are ignored in their entirety. 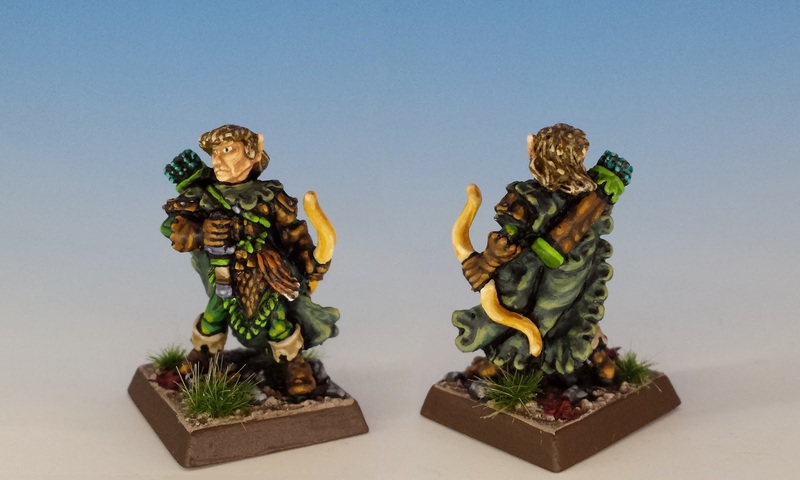 He is a very detailed mini! Lots of texture on his clothes. I like that sculpture particularly because Legolas has a slightly feline look on his face, which makes him quite unique. Thank you very much everyone for the feedback! I'm really glad to know that you're enjoying these grand old minis. Beautiful! 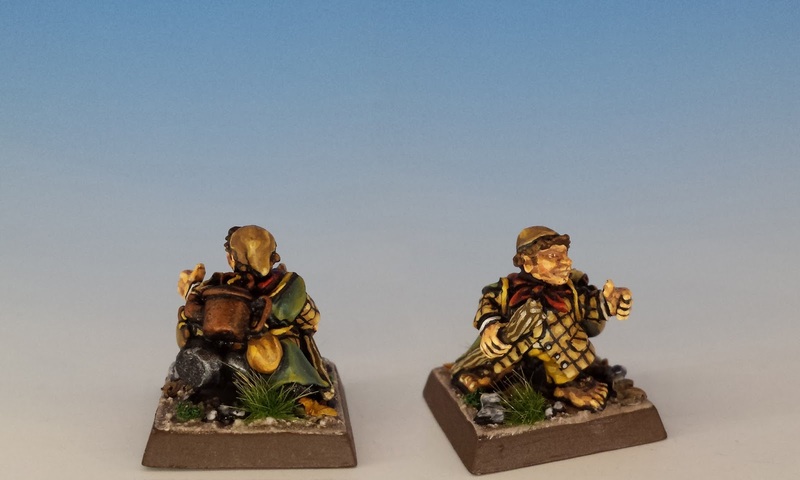 I agree with your assessment of the realism of the figures -- whilst I do like the Perry range, they are too tied to the movies for me whereas these have the wargame-y look we all love. If time and money were without limit, an old-school style LoTR project would be something I would love to do. Yes - I've mulled over trying to collect more of the LotR range, especially the dwarves and orcs... especially the Uruk Hai. But they are so expensive on eBay... and I've got so many other projects to get to first. I'm glad that you liked the shield! That took a long time. I always thought that the White Tree was a cool insignia. Excellent figures!Beautiful shadings and colors! amazing work on such old models, well done. 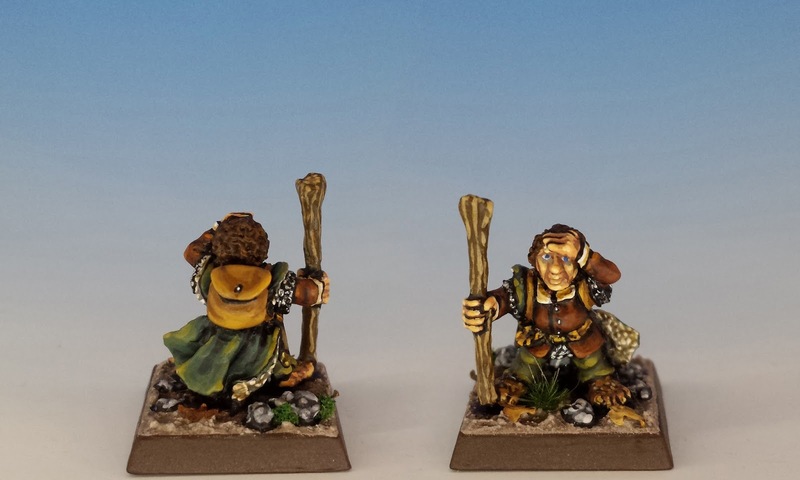 I guess not many modern fantasy miniature manufacturers make hobbits/halflings in this rounded and childlike manner. Most are sculpted to look like svelte little men. I've never had much cheese for that style of halfling. Fantastic! Love the way your bringing back to life these old figures... It's got me thinking I'd like to collect the range as well! 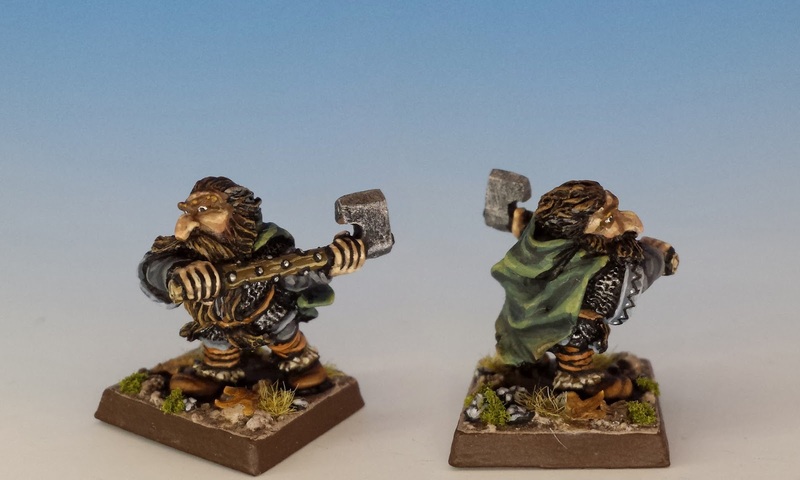 Great minis and paintjob. I was amazed at noticing the similarity of the cover of the set box compared to Angus McBride's cover for MERP. There is definitely a relation! Good eye! You made me want to go look at old McBride paintings, and they are amazing.